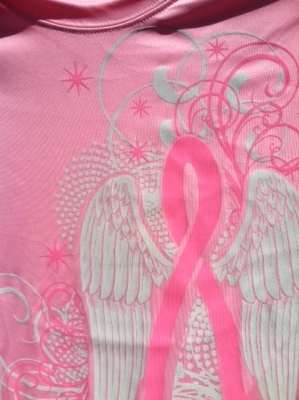 This awesome pink wicking shirt is exclusive to the Pink Wings website. The shirt is a high performance, wicking shirt and comes in pink, black or white in sizes S-2XL. Sizing runs small- so you may want to order one size up. Great for those participating in a 3-Day Walk, Avon 2 Day Walk, Relay for Life, Race for the Cure, or any other cancer awareness event! This shirt is also available with the word Survivor going up the side. Order yours today! Please choose size, color and style from drop down menu.